Capable of making wood crosscutting projects a cakewalk, you can also attach apt blades to this device and get to work on plastics with the same level of accuracy and efficiency; some types of aluminum based materials can also be considered. Quality : Made from the best materials and crafted in an industry approved design, the Dewalt DWS780’s quality is unmatched. It is both practical and aesthetic with flexible features and functionality. 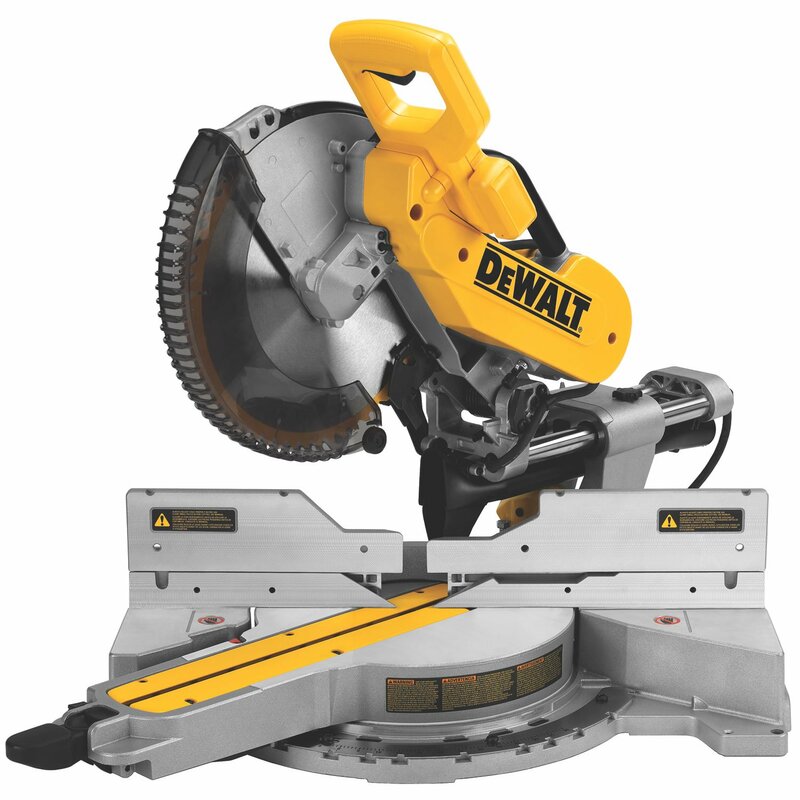 Performance : You can adjust the DWS780 to cut vertical (bevel) and horizontal (miter) angles simultaneously. Other features on this saw make it possible to cut complex angles in one single session. Robustness : With a hard steel make and durable components, the robustness of the DWS780 is not questionable. Equipped with a sturdy and weighty base with ideal center of gravity it will not tilt or fall off even when attached to a slider. A dust collection system does an excellent job of collecting 75% of generated dust during work sessions with this Dewalt device. From 15 amps of power output to 3000rpm worth of motor action, you can appreciate the force and rate of work of this product. It may not have a stand but it makes up for that with an outstanding design that can cut lumber upto 2×16 in dimensions at a 90-degree angle while it uses a 45-degree angle to slice 2×12 dimension lumber. Thanks to its exclusive back fence design, the DWS780 can perform these and other actions. A cross cut positioning system made after the XPS design is integrated into this saw and provides adjustment-free indications on where to cut. It is equipped with a stainless steel miter detent plate that is fully adjustable. You will find 10 positive stops on the plate that enhances accuracy for the task at hand. The 12-inch 60-tooth fine finish blade makes short work of most cutting tasks. Once it has been set to 0°, cutting boards that are 13.75 inches wide and 4.4 inches thick is not hard for the Dewalt DWS780 to face. Using the ‘back fence’ feature you can straight-cut through 16-inch wide boards. Such diverse functionality is much welcome in power saws of this type. You have positive locking mechanisms at all standard miter angles. Professionals adore the small black lever situated to the left of the lock handle and miter latch button. It allows them to override their locked selection in an emergency. Two foldaway pawls on either side of the machine have given users the chance to stop bevels at 22.5° and 33.9°. The latter has been used with a 31.6° miter setting and users have cut mouldings for 90° joints. This is an incredibly flexible option. To make matters better, the silver hued lever on the bottom serves as a 45° override and lets you alter bevel angles slightly from the chosen value. And, yes, you can do it in either direction. It has smart locking and override features that ensure precision and efficiency during cuts. Being a double bevel model, the DWS780 can tilt toward both the right and left. Complex angles are therefore possible, as in the case of tapered boxes and crown moulding projects. The work light is wonderfully positioned to illuminate in such a way that the blade’s shadow falls onto the work piece and aligns the blade with the cutting line. It has been known to serve better than any laser system. This is thanks to the fact that even without the need for re-alignment the work light casts a shadow of the kerf (aka thickness) of the saw blade’s exact width. As observation during projects go, this can save you time, resources, material, and money. Lasers, however, shed the same indication line width no matter the blade’s thickness; trial and error springs to mind. Sliding miter saws do have their shortcomings, and they have not skipped this product either. A good amount of space is required behind the saw if the rails are to slide ideally. Compactness is not often the case with the DWS780. While 75% of dust (maybe less) is removed by the dust collector, that still leaves 20-25% that needs cleaning up. This means extra investment or expenditure to get a barrier system, shop vacuum, or external dust collector. In a way, this is merely an expected inconvenience. After all, if the dust bag already on the device were any larger the saw will demand even more rear distance, which can become a compactness and portabilty issue. 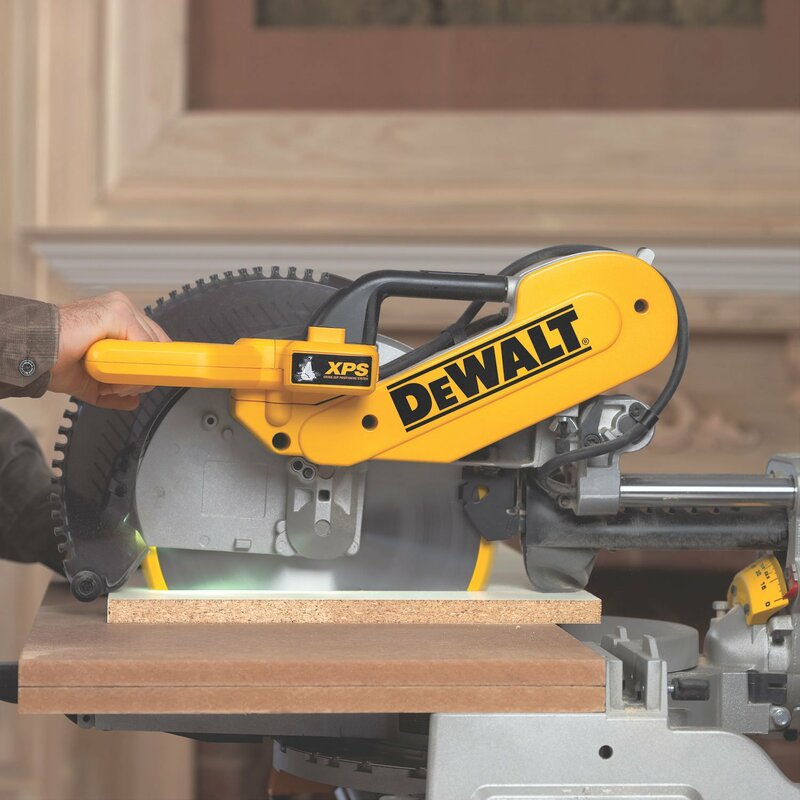 With ace functionality and diversity, as detailed in the ‘what users say’ section above, we would like to declare the Dewalt DWS780 an excellent choice where miter and bevel saws are concerned. In fact, we would also like to add a few pointers to what has already been said. You read about bevel adjustments earlier. You can lock or loosen these settings using the 3-wing knob at the back of the saw. There you will spot a yellow cam-action switch. The 0° bevel stop needs to be rotated or pulled out to turn the bevel to the right. Adding further flexibility is a depth stop feature made of a wing nut, depth adjustment screw, and the actual stop. You can use it to limit the blade’s cutting depth and gain remarkable control when dealing with taller work pieces or performing grooves. The blade performs better than most others on similar saws. Bear in mind, that this is in reference to general construction tasks not fine woodworking. You can buy premium blades to help make cleaner cuts. A sturdy hold-down clamp adds adequate support for the device. Though there are no out feed supporters, users most often prefer the saw with stationary or portable stands. All in all, the saw has everything and then some. It could well be your dream power tool. 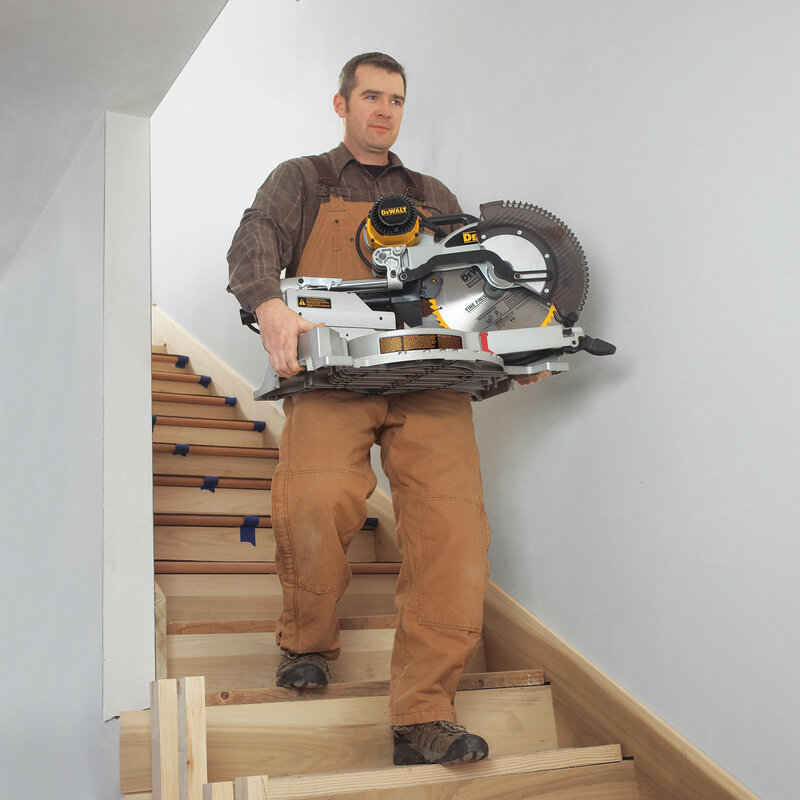 With an excellent blade that is complemented by the work light (which works better than a laser system), and a flexibility that is rare in most bevel and miter saws, the Dewalt DWS780 has proven to pack so many practical features while keeping usage and accessibility simple and incredibly efficient.